Microsoft have today announced the web version of the Skype, this means now users can use Skype without download the Skype application. 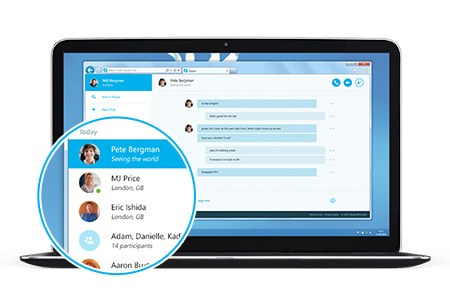 Company finally rolled out the new web version of Skype, which is still in beta stage. As it is in beta stage Currently, the web service is available only in the US and UK, and users of US and UK can sign in and connect to Skype for Web to get to their conversations in an instant without downloading the Skype app. As the web version is in beta stage, hence users of other countries need an invitation to use it. The web view is available for Chrome, Firefox, Internet explorer and Safari browsers. As I am from India and the web version of Skype is not available in my country. But then also with the simple tweaks we can use enjoy the web version of the service and that too also without any invitations. Just Follow the below steps to get the web version of Skype. As the service is available for Chrome, Firefox and Internet Explorer, here I am showing the tweaks on Chrome browser. Firstly download the Zenmat Chrome extension from Chrome Store, and install it. Now on the Zenmat extension, set the location to US. After location setting browse to web.skype.com to browser web version of the skype. Login to your account and you will be redirected to the web version of the Skype. You can also use VPN service to access the web version of Skype, instead of Zenmat extension. Here is the Video Demonstration on How to use in Other countries.